There are many ways to add Google Analytics tracking code to your website. Whichever solution you choose, the objective is the same one: add some lines of code to your website’s header. Probably the quickest and easiest way to do it, it requires a simple code edit. Just go to Appearance > Editor > header.php and add your Google Analytics code right before the ending </head> tag or after the opening <body> tag. If you add this code to header.php, you know for certain it will appear on your website. 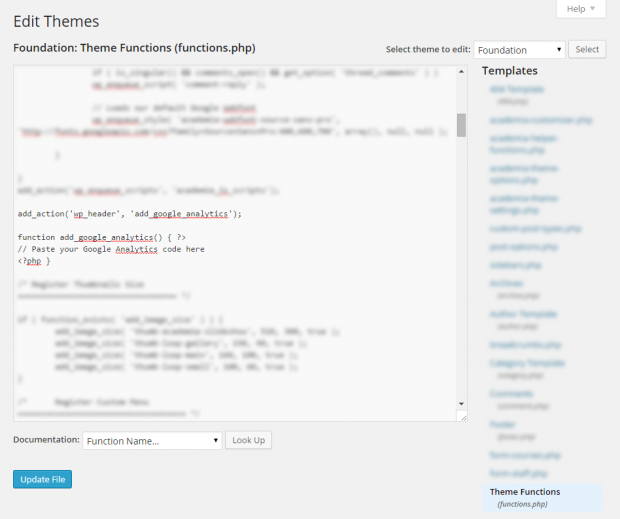 On some WordPress installations the Appearance > Editor page might be disabled for security purposes. Another method that requires file editing, many people advise to stay out of header.php and add this code to functions.php instead, via a custom function. Adding this code to functions.php will keep your header.php file lighter and easier to manage, without the code there. 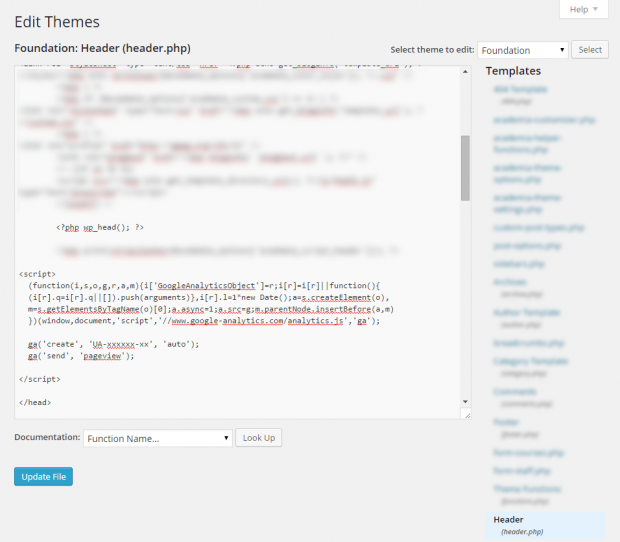 Using a plugin is the recommended way to add Google Analytics code to your website. There are many plugins (link) that add the code, some of them can even integrate Analytics directly into your admin dashboard. The code will appear on your website at all times, no matter if you use one theme or another, if you update a theme, customize it, etc. You will have one extra plugin just for the Google Analytics code. 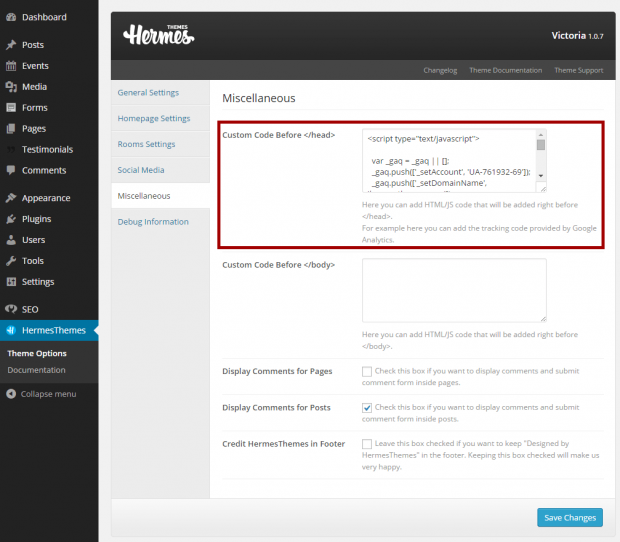 If you are using a WordPress theme by HermesThemes, then there is a 4th option available. Simply go to the Dashboard > HermesThemes > Theme Options page, the Miscellaneous tab, and add your Google Analytics code there. You can customize your HermesThemes theme without worrying about deleting this code. All of the above methods are fine, as long as you understand the pros and cons of each one. Whichever method you decide to use, just don’t forget to make sure that your stats are being gathered properly and that you are not missing out on precious data about your website. Founder and WordPress developer at HermesThemes. With over 7 years of experience in the hospitality industry, it is my strong belief that WordPress brings unprecedented opportunities for independent hotels, B&Bs and inns. Over a thousand of amazing properties worldwide use our Hotel WordPress Themes on their websites. HermesThemes is a family-run business that helps hoteliers and innkeepers create, update and improve their websites. We create affordable, easy to use WordPress themes for independent hotels, B&Bs and inns. Fast and friendly support for all types of users, from rookies to professionals.